The demand for electric sliding gates across the UK just keeps on rising, and this is reflected in the Bedfordshire town of Luton where 1st Choice Security Systems have been installing electric automatic security gates for over a decade now. Our teams of installers would normally recommend sliding security gates where a drive has insufficient space to allow for swing gates, or where a driveway slope would cause scraping or jamming. The electric sliding gate provides a discrete form of security for domestic clients who are installing security gates for the first time and don’t want anything too ‘showy’; they can also be augmented by adding a door access control system for elderly residents who are concerned about doorstep scammers or burglars. Over the years Luton has received more than its fair share of bad press about the high levels of crime reported across the town centre. The most recent crime stats demonstrate an encouraging decrease in burglary figures, violent crime and anti-social behaviour. This is certainly a cause for celebration, and we would direct the plaudits to all those responsible business owners, small retail outlets and residents who showed a united front by creating a proactive security perimeter across the town environment through the installation of electric security gates. Again and again our installation team reports that where the residents and business owners show a united front against crime through the use of a visible deterrent, there is a real decrease in the rate of criminal activity being committed. How Do I Go About Installing Electric Gates in Luton? If you have been thinking about installing automatic gates in Luton in order to secure your home, shop or business but just haven’t known how to start, then we can put your mind at rest – you just give 1st Choice Security Systems a ring and we will explain the process step-by-step. We are a local business ourselves and we know the town centre well. Our team of engineers have experience in designing and installing electric gates in Luton and across the county of Bedfordshire for premises large and small, industrial and domestic. 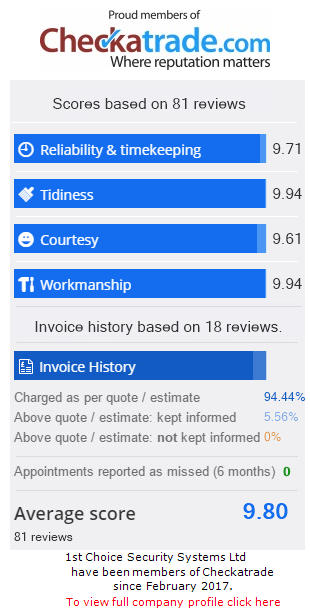 We always start by talking to prospective customers about their particular security concerns, and then we assess their site or property in order to determine the most cost-effective security system we can offer in response to their specific requirements. We may advise that automatic gates are sufficient, or if we feel that an extra layer of security would be helpful we will discuss alarm systems, CCTV, or access controls. If you are interested in learning more about electric sliding gates in Luton, contact our friendly staff today on 0800 118 2414. We have experience in fitting all kinds of automatic gates in areas such as Dunstable, Whipsnade, Studham, Flamstead, Harpenden, Lilley, Flitton & Greenfield, Pulloxhill, Barton Le Clay, Toddington, Old and New Bedford Road – See a recent gate project carried out for a local development of three houses in Greenfield, Bedfordshire. Our CAMESAFE Installers have vast knowledge and experience to be able to offer the required security solutions and automation safety for all our electric sliding gates in Luton. Long gone are the days of ugly security fixtures; part of the initial discussion our installers and designers have with customers is about the material, texture and aesthetic of the security gates they are considering having fitted. 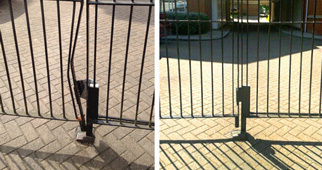 We know that carefully installed and regularly maintained automatic gates in Luton will add to the value of your property; carefully designed security gates increase the value even more. We care about our customers’ security, and we also care for the look of the security we provide them with.